For those birders who relish long walks in biting cold winds, coastal sparrow searches in winter can turn up one of the rarer subspecies of the common Savannah Sparrow, the “Ipswich” Savannah Sparrow. One recent winter, although not a particular fan of cold weather, I went seeking photographs of this bird at a location recommended by my friend Buzz Devine. We had found them on a recent Christmas Bird Count on the sand dunes between Long Beach Park in Stratford and Pleasure Island in Bridgeport, and sure enough a small flock of about six birds popped up among the dune vegetation after about a half-hour of kicking around. 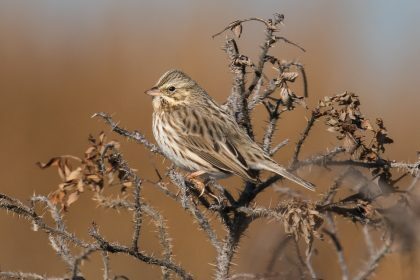 Like many sparrow species, Savannahs come in a variety of colors and sizes, ranging from the large and pale Ipswich to the darker and smaller “Beldings” subspecies of coastal California. Distinguishing the Ipswich from the more common run-of-the-mill Savannah Sparrow can take a bit of effort, but habitat, time of year, and careful observation will usually provide sufficient information for a positive identification. What it looks like: Savannah Sparrows all show a characteristic yellow eyebrow strip (or supraloral), which may vary in intensity, but otherwise this species generally resembles several other streaked sparrows, such as Song and Vesper, which may occur in the same habitat. On the pale Ipswich subspecies, the yellow eyebrow can be completely washed out, so comparisons to similar species must look for such field marks as the chest spot on Song Sparrows or the eye-ring on Vesper Sparrows. Of course, ruling out the typical Savannah Sparrow subspecies found in Connecticut (Passerculus sandwichensis savanna) requires some subjective judgment as to the “paleness” of the bird in question. Where to Find It: This subspecies nests primarily on Cape Sable Island, Nova Scotia, and only rarely on mainland Nova Scotia. It winters on sand dunes along the Atlantic coast south as far as Georgia. In Connecticut, Ipswich Savannah Sparrows can be found in winter at several publicly accessible coastal sites such as Long Beach Park and Stratford Point in Stratford, Milford Point in Milford, Hammonasset Beach State Park in Madison, and Barn Island Wildlife Management Area in Stonington. Walk along the dune or the upland edge of the beach until you see a small flock of pale sparrows jump up. With patience, they will eventually perch for good views and study of their plumage characteristics. Other times they may skulk through the beach roses and dune grass requiring a bit more work to get a positive ID. Either way, it’s a good birding exercise and a nice way to get some fresh cold air on a winter day. 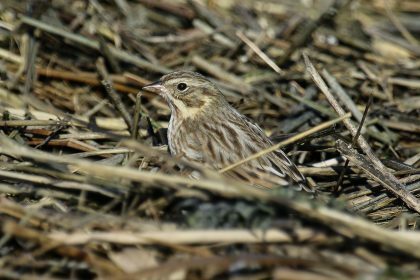 However, in some coastal habitats, Savannah Sparrows have lost habitat and the small breeding range of the Ipswich Savannah as well as interbreeding with the nominate race may eventually imperil the subspecies. Interesting Facts: The Ipswich is one of 17 currently recognized subspecies of Savannah Sparrow. Historically, 28 different subspecies have been identified, according to BNA Online, but almost half of those cannot be distinguished. The Savannah Sparrow was named by Alexander Wilson in honor of the town of Savannah, Georgia, where the type specimen was collected. Savannah Sparrows tend to return to the same nesting locations, many of which are islands, which is likely the cause of the evolution of subspecies such as the Ipswich Savannah Sparrow.